As an ancient Chinese philosopher wrote, a tree has to strike a firm root before it can flourish. Facing exceptionally fierce competition in the past year, we focused on customer demands with precision insights, and brought edges of ecosphere convergence into full play to forge ahead against headwinds. As a result, we broke the record in many aspects including subscriber net addition and revenue scale, exuberating vigorous growth momentum. 5G is just around the corner and will bring profound changes to our life. We have been proactively promoting the technology upgrades, while forcefully cementing our network foundation, in the hope of bringing a fresh experience to our customers through the convergence of innovative services. We will leverage our deep-rooted integrated information services capabilities as well as ecosphere edges to enthusiastically embrace new opportunities. We firmly believe that China Telecom, which is full of vibrancy, will soar to a new height and achieve greater success! In 2018, the Company firmly grasped the opportunities arising from the development of digital economy, and rode on the tide by leveraging the precision insights into market trends and customer demands. We adhered to the new development principles and carried out supply-side structural reforms. We responded effectively to the complicated and challenging external environment, as well as increasingly fierce competition, achieving new breakthroughs in expanding our business scale while firmly elevating our corporate value, thereby reaching a new high in terms of overall competitiveness and market position. Over the past year, the Company deepened its implementation of step-up transformation while promoting reform and innovation on all fronts. We also proactively prospected the landscape for 5G development and built all-rounded competitive advantages. We accelerated the development of new impetus, deeply incentivised corporate vitality, strove to break new ground in terms of high-quality development, and remained committed to creating new value for shareholders. In 2018, operating revenues of the Company amounted to RMB377.1 billion, of which, service revenues1 amounted to RMB350.4 billion, representing an increase of 5.9% compared to last year (if excluding the impact of the application of International Financial Reporting Standard 15 for the current year, it represented an increase of 7.2% over last year), with revenue growth having surpassed the industry average for many consecutive years. Revenues from emerging businesses2 accounted for 51.9% of service revenues, representing an increase of nearly 6 percentage points compared to last year following a continual optimisation of the revenue structure. EBITDA3 reached RMB104.2 billion, representing an increase of 2.0% over the same period last year. Net profit amounted to RMB21.2 billion, representing an increase of 13.9% compared to last year, while basic earnings per share were RMB0.262, achieving rapid growth. Capital expenditure was RMB74.9 billion, representing a decrease of 15.5% compared to last year, the third consecutive annual decline. Free cash flow4 reached RMB22.5 billion, representing a remarkable increase compared to last year. Taking shareholder returns into consideration, alongside the Company's profitability, cash flow level and capital requirement for future development, the Board of Directors has decided to recommend at the forthcoming shareholders' meeting that a final dividend equivalent to HK$0.125 per share for the year 2018 to be declared, representing an 8.7% increase over the year 2017. Going forward, the Company will continue to create shareholder value, while fully balancing the cash flow required for the long-term development of the Company with returns to shareholders. In 2018, the Company seized the precious opportunities arising from the benefits released from data traffic, while actively capitalising on increasing demand from corporates subscribing for cloud services. The Company expedited products innovation, promoted overall upgrade of its services convergence, strengthened its network edges, and improved its operational capability. As a result, the Company rapidly improved its competitiveness, achieved a record high pace in terms of market expansion, and rapidly magnified its growth momentum. The Company's mobile service revenues amounted to RMB167.7 billion, representing an increase of 9.1% compared to last year. The total number of mobile subscribers reached 303 million, a net addition of 53.04 million subscribers, which hit a record high. The market share of mobile subscribers net addition reached 44%, while overall market share increased to 19.6%. Out of this, the number of 4G subscribers was 242 million, a net addition of 60.39 million, maintaining an all-time high pace of growth. 4G penetration rate reached 80%, making the Company an industry leader. Aggregate handset data traffic also grew strongly by nearly 3 times, with 4G DOU reaching 5.5GB. Handset Internet access revenue grew by 22.4% compared to last year. Wireline service revenues amounted to RMB182.7 billion, representing an increase of 3.1% compared to last year. The number of wireline broadband subscribers reached 146 million, a net addition of 12.26 million, achieving a 6-year high. Out of this, the proportion of wireline broadband subscribers of 100Mbps or above accounted for 66%. The growth of revenues from the Company's Intelligent Applications ecospheres5 accelerated further and contributed over 50% to incremental service revenues. With "cloudification"6 on all fronts, the development of the Company's DICT and Internet of Things (IoT) businesses was accelerated by the uptake of cloud-network integration and IoT-cloud integration. Revenues from IDC and cloud services increased by 22.4% and 85.9% respectively compared to last year, contributing nearly 2 percentage points to service revenues growth. The Company made further breakthroughs in accelerating the growth of IoT services, with IoT revenue and the scale of connected devices doubled yet again. With the overall upgrade of services convergence, the Company rapidly expanded the market through the bundling of "large data traffic, 100Mbps broadband, and Smart Family" products. The number of e-Surfing HD (IPTV) subscribers reached a new high of above 100 million, enabling Smart Family application to achieve a meaningful scale. The Company also built an integrated platform for Internet Finance, resulting in synergies with the mobile business to promote mutual scale development. The number of average monthly active users of BestPay exceeded 43 million, and the aggregate gross merchandise value for the year exceeded RMB1.6 trillion. Taking advantage of the historical opportunities brought about by industrial integration, consumption upgrade and new technological breakthroughs, the Company built on its current achievements and forged ahead. Focusing on our three major goals of "building Cyberpower, building first-class enterprise, and building better lives", we expedited step-up transformation on all fronts, and further promoted reform and innovation. We continued to strengthen our capabilities at all levels, while planning future development from all angles. Focusing on user experience, business scale expansion and value management, the Company pushed forward the construction and intelligent upgrade of its network to build up comprehensive network advantages. Leveraging Big Data analysis, we deployed dynamic capacity expansion of 4G network with precision, and further optimised in-depth coverage at key locations. The number of 4G base stations reached 1.38 million, effectively supporting the upgrade to VoLTE high definition voice, as well as the continuous growth of large data traffic business. Our fibre network now fully covers all cities and towns in the service area of the Company, enabling a leading customer experience. By leading the deployment of Gigabit fibre broadband, we established a new edge in broadband network. We continued to enhance our NB-IoT network, and built a whole-range speed rate IoT structure, which combines high, medium and low speeds, supporting further expansion in vertical industries. By pushing forward cloud-network integration at full throttle, we continued to optimise our nationwide deployment of cloud resources and backbone network coverage, resulting in the establishment of a cloud-led network. By introducing new technologies such as Software-Defined Networking (SDN) and Network Functions Virtualisation (NFV), the Company accelerated the re-constitution of its networks, and rolled out scale promotion of intelligent self-selecting bandwidth network products for government and enterprise customers as well as home gateway products based on SDN technology, which allows our network products to be activated within minutes. We also launched a VoLTE virtual IP Multimedia Subsystem (vIMS) core network with software and hardware decoupling, facilitating the progress of cloudification and virtualisation. This significantly strengthened our competitiveness and differentiation in the cloud market, while laying a foundation for 5G network cloudification in the future. The Company proactively contributed to the formulation of international standards for 5G technologies and conducted large-scale network trial runs in a number of locations. We achieved some preliminary progress in areas such as voice call, 4G/5G interoperability, and interoperability between equipment, among others. By supporting the Ultra HD live broadcast for CCTV’s 2019 Spring Festival Evening Gala with "5G+4K" and "5G+VR" solutions, we took an important step towards the successful accomplishment of enhanced mobile broadband (eMBB) application scenarios. The Company also actively explored applications for other vertical industries, such as 5G autonomous driving bus, smart water treatment and mobile remote medical service. The Company accurately grasped changing market demand and expanded the market by leveraging its data traffic and cloud products, cultivating convergence operation, and effectively bundling its services. As a result, the overall competitiveness of our bundled products was significantly strengthened, which facilitated rapid breakthroughs in expanding market scale, thereby creating new avenues for value growth. The synergies that resulted from the integration and mutual development of our five ecospheres enabled us to explore new paths towards future sustainable development. In the field of Intelligent Connections, insisting on customers' value management, we upgraded convergence to expand in the incremental market space and extend our reach to the fields of content, applications and services. We also broadened sales channels and promoted products value, laying a foundation for Intelligent Applications such as e-Surfing HD, DICT, and IoT to grow rapidly. 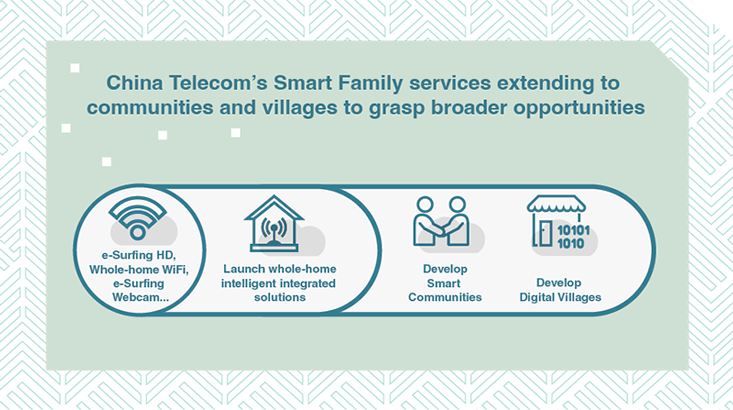 In the field of Smart Family, by leveraging e-Surfing HD service as a portal, we developed a number of differentiated core applications including Smart Home Networking services and family cloud products. We expanded our extensive range of smart home products and implemented strategic planning in Ultra HD video market ahead of time, in order to grab the opportunities from consumption upgrade of smart home products. In the field of DICT, we strengthened the edge from cloud-network integration, and continued to drive the development of dedicated line, DICT and IoT services through "cloudification". This allowed us to vigorously expand our solutions and service capabilities for supporting vertical industry applications and proactively explore the applications of 5G technologies in areas such as smart cities, autonomous driving, and industrial Internet. We also explored new business models by leveraging features of 5G technologies to enable vertical industries. In the field of IoT, in order to extend to the high end of the industry value chain, we leveraged our competitive edges in network and platforms to quickly expand application scenarios and explore application services based on IoT-cloud integration and data operation. In the field of Internet Finance, riding the momentum from China’s leadership in global mobile payments, the number of BestPay customers and participating merchants grew rapidly alongside the gross merchandise value. We also developed red packet and instalment payment platforms, which significantly boosted the stickiness of mobile subscribers and fuelled strong subscriber growth, while also effectively promoted the expansion of new retail and integrated retail channels. The integration and mutual development of ecospheres achieved outstanding results. 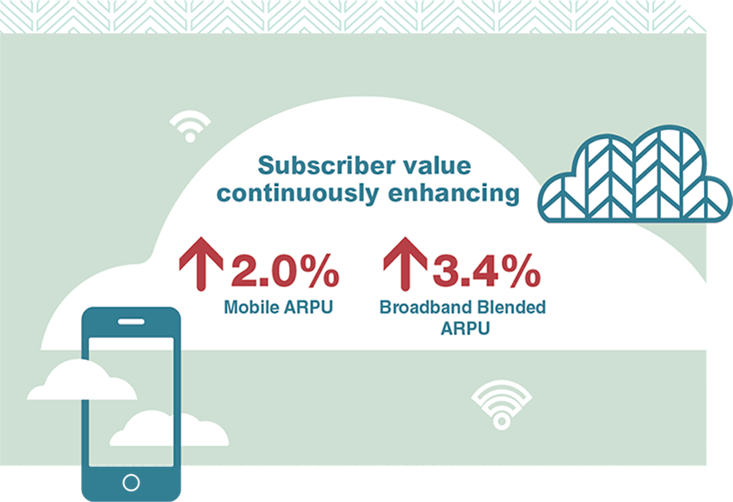 The triple-play penetration rate7 of broadband subscribers reached 65%, representing an increase of 13 percentage points compared to last year. Out of this, the penetration rate of e-Surfing HD subscribers reached 72%, effectively expanding the potential market space for Smart Family. The growth of DICT revenue exceeded 20%, gradually becoming a new growth driver for the Company. The number of IoT connected devices exceeded 100 million, moving into the fast track of development and accelerating readiness for the arrival of 5G era. Active participating merchants of BestPay more than doubled, enabling the mobile payment ecosystem to become a key means of differentiation in mobile business development. Following the consolidation of our IT infrastructure and the greater adoption of new technologies such as Big Data and artificial intelligence (AI), the Company injected more intelligent elements into operation, leading to efficiency improvement and productivity enhancement. Our data utilisation capability was also enhanced considerably. We continued to intensify our efforts to establish a corporate core backed by data utilisation and completed IT cloudification, which facilitated the transformation of IT towards agile development, agile operation and intelligent decision-making, in order to develop an open system for digital capabilities. Our channel operational capability continued to strengthen with the establishment of an integrated channel system of "self-owned + third party", "online + offline" and "platform + sales reach" channels. The proportion of customers acquired from online channels increased significantly. The coverage rate of precision marketing backed by Big Data exceeded 60%, which enabled per customer acquisition costs to decline by over 15%. The advantages of intelligent customer service capability have begun to emerge. As we progressively introduced AI-based customer service, service volume delivered by chatbots reached 460 million times, while the proportion of interactions facilitated by intelligent voice services exceeded 30%. We have the lowest customer complaint rate in the industry, and are currently ranked the industry’s best for customer satisfaction with mobile and broadband services as well as in overall terms. Our network operational capability also reached a new level. In-depth end-to-end quality assurance for our mobile business was carried out, while our fibre broadband business has formed a closed loop of "probe management — quality monitoring — network optimisation". Our management and operational capabilities have steadily enhanced, while our efficiently-centralised and co-sharing financial capability has continued to improve. We also pushed forward centralised procurement as well as centralised supply chain, while continuously improving the efficiency of resource allocation and value management. We also strengthened our risk prevention and control mechanisms, ensuring our ongoing sustainable and healthy corporate development. The Company sought to implement reform and foster innovation in all parts of its operation, constantly enhancing the vitality of corporate development and operational capability. We continued deepening the three-dimensional inter-driven reform and mixed ownership reform in the emerging areas, which deeply stimulated the vitality of corporate development. We also intensified the reform of "Sub-dividing Performance Evaluation Units, Professional Operation, and Top-Down Service Support System", through which we introduced a mechanism for market-oriented recruitment, incentivisation and resource allocation. As a result, we effectively motivated our employees and improved the efficiency of sub-dividing operation. The aggregate number of sub-dividing performance evaluation units reached nearly 60,000, which basically covers our entire frontline units. We laid a solid foundation for leapfrog development, with our BestPay company completing the introduction of first round strategic investors, which helped diversify its shareholding structure and push forward mixed ownership reform. The Company also promoted its ecological endowment and accelerated the reform of technological innovation system, focusing on the enhancement of operational capability. We also formed a new blueprint with capability development centres in areas such as cloud, DICT applications, Smart Family and IoT. We beefed up headquarters’ overall planning, strengthened our expansion in local markets, and elevated the core capability of our products and our business scale. We also restructured our R&D system and consolidated our research capability by launching China Telecom Research Institutes and 5G Innovation Centre. We also made further breakthroughs in reforming our career advancement and employee incentive mechanism for technical talents, enabling us to master key technologies in the field of information communications. We have always been committed to upholding a high level of corporate governance and insist on governing the Company in accordance with laws and regulations. We attach great importance to risk management and control, and have continuously enhanced corporate transparency to ensure the healthy and sustainable growth of the Company. Our efforts have been widely recognised by the capital market. In 2018, we once again received a number of awards, including "Most Honoured Company in Asia", awarded by Institutional Investor, for the eighth consecutive year. We were also awarded "Best Managed Company" and received a special accolade of "Most Honoured Company (2009-2018)" by FinanceAsia. In addition, we were also the only telecom operator in mainland China and Hong Kong awarded the "Most Outstanding Company in Hong Kong — Telecommunication Services Sector" by Asiamoney. Other awards received included "The Best of Asia — Icon on Corporate Governance" by Corporate Governance Asia; "Platinum Award — Excellence in Environmental, Social and Governance" and "Best Initiative in Diversity and Inclusion" by The Asset. These awards demonstrate the Company's excellent level of execution, as well as its leading position in the industry within the Asia Pacific region. We continued to proactively meet our social responsibility obligations, while adhering to the principles of innovation, coordination, environmentalism, openness and sharing. 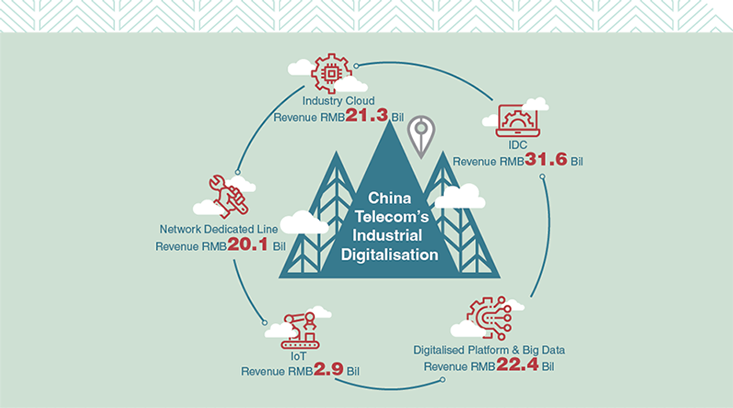 In line with our status as a major force for constructing "Cyberpower, Digital China and Smart Society" and as a network infrastructure provider, we continued to implement the "Speed Upgrade and Tariff Reduction" policy, by cancelling domestic data roaming fees as of 1 July 2018, which benefited our customers and propelled the upgrade of information consumption and industrial digitalisation. In addition, we earnestly carried out industry regulatory policies, maintained market order and protected customers' rights. We safeguarded network and information security, striving to create a clean and healthy cyberspace. We also fulfilled our obligations to customers and enhanced the capability and efficiency of our smart services. We also actively provided platforms for our employees to display their talents, and fostered coordinated value enhancement between individuals and the Company. By pushing forward energy saving and emissions reduction, as well as green development, the per unit general energy consumption of information data traffic was reduced by 16.8% year on year. Through the co-building and co-sharing of communications infrastructure, we also effectively reduced the duplication of projects. Through our proactive adherence to "the Belt and Road" initiative, we connected cross-border information passageways across the Guangdong-Hong Kong-Macau Greater Bay Area, and achieved a number of breakthroughs in the construction of strategic passageways, thereby progressively enhancing our capability to provide global network resource services. We also received a high level of recognition and appreciation from the wider society for our efforts in successfully delivering telecommunication assurance for major conferences and events including The Shanghai Cooperation Organisation (SCO) Qingdao Summit, as well as for combating flooding and disaster relief. At present, the national economy has entered a stage of high-quality development, which is accelerating the conversion of old impetus into new ones. New technologies represented by 5G and AI are integrating and evolving, enabling them to support supply-side structural reforms, which will lead to a rapid expansion of potential value for digital economy. As the next generation infrastructure, 5G network will become even more intertwined with applications and telecom operators will play an increasingly pivotal role in the information communications industry. The Company will actively explore commercial applications of various new technologies, accelerate the development of operation mechanisms that are adapted for 5G, and capitalise on its advantages to promote ecological services ahead of time. Recently, China Telecom was awarded the 3.5GHz band to conduct nationwide 5G network trials. Leveraging the advantages of the 5G mainstream frequency band and insisting on open cooperation, we will accelerate 5G deployment proactively and pragmatically. Persisting in a market-oriented and demand-driven approach, we will appropriately manage the momentum, propel the development of non-standalone (NSA) and standalone (SA) concurrently, and progressively expand the scale of network trials and the pilot project of 2B/2C applications. Whilst the vigorous development of digital economy has presented us with historical opportunities, we are clearly aware that our future external environment is becoming complicated and challenging. While the macro economy is facing downward pressure, cross-industry and homogeneous competition is also becoming increasingly intense. As a result, transforming development model and pursuing high-quality development have now become the Company's top priorities. Persisting in the principle of new development and supply-side structural reforms, the Company will accelerate its advancement towards high-quality development, and proactively fulfill the requirements of "Speed Upgrade and Tariff Reduction". With scale development as the foundation and value management as the core, the Company will continuously push forward with "cloudification" and accelerate ecological endowment. The Company will build a "Trinity" value management system, featuring convergence, integration and intelligentisation, for high-quality development, while marching towards becoming a leading integrated intelligent information services provider and constantly creating new value for shareholders. Finally, on behalf of the Board of Directors, I would like to take this opportunity to express our sincere appreciation to all our shareholders and customers for their support. I would also like to express our sincere thanks to all our employees for their hard work and contributions. Furthermore, I would like to extend our sincere gratitude towards Mr. Yang Jie for his outstanding contributions towards step-up transformation and sustainable development of the Company during his tenure. At the same time, I would like to welcome Madam Zhu Min and Mr. Yeung Chi Wai, Jason to our Board of Directors team. Service revenues were calculated based on operating revenues minus sales of mobile terminals, sales of wireline equipment and other non-service revenues. Revenues from emerging businesses included revenues from data traffic, Internet applications and ICT services. EBITDA was calculated based on operating revenues minus operating expenses plus depreciation and amortisation. Free cash flow was calculated from EBITDA minus capital expenditure and income tax. Intelligent Applications ecospheres include ecospheres of Smart Family, DICT, IoT and Internet Finance. DICT is the converged smart application service integrating three technologies, namely communications technology, information technology and cloud & Big Data technology. Cloudification refers to the comprehensive upgrade of services and network to cloud in terms of infrastructure, products service capabilities and sales mode, with a focus on cloud computing. Triple-play penetration rate represented the proportion of broadband subscribers who also subscribe for mobile and e-Surfing HD services at the same time.